The Las Vegas Fashion Show Mall is a swanky shopping complex located on the northern portion of the Las Vegas Strip in Las Vegas, Nevada. This is a massive mall with over 1.8 million sq. ft (175,415.0 m2) of space, making it one of the largest enclosed malls in the world. The Mall has over 250 stores, seven anchors (including a tony line up: Saks Fifth Avenue, Dillard’s, Neiman Marcus, Macy’s) an elevated stage, a fashion runway, and the famed Cloud. The Cloud, a flying saucer-shaped canopy skewered between two massive pillars, is 128 ft (39 m) above the sidewalk and 480 ft (150 m) long. The structure is designed to provide shade from the scorching Las Vegas sun under the east entrance and serves as a movie screen by night. I like this particular vantage: the silvery belly of the Cloud; the interplay of form and space. 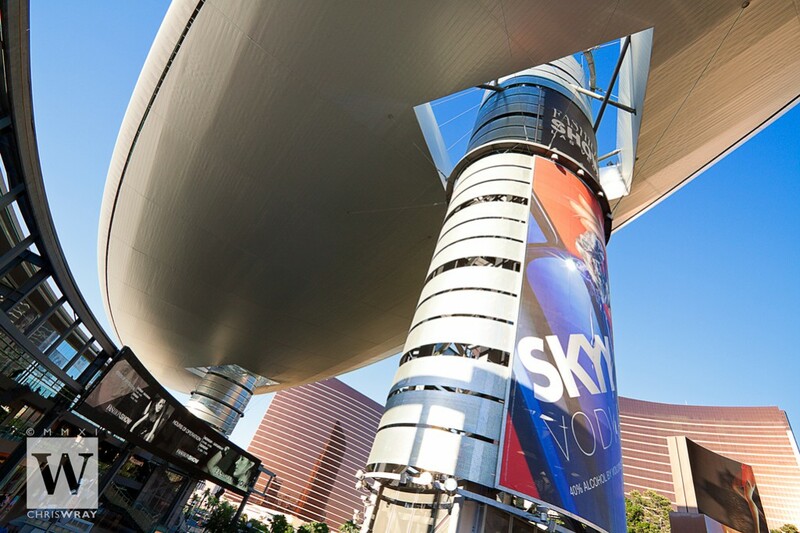 Ironically, the billboard on the pillar features Skyy Vodka — a fitting combination under a cobalt sky and silver cloud. Cool angle! Might see that in a couple of weeks! Good Lord, what a sense of scale! Love this shot Chris, what a unique and fabulous composition you used here! Nice shot Chris. I was in charge of the construction of “The Cloud” and helped in the design and materials chosen. I always like to hear the comments of the people passing by when I am there. I also oversaw the underwater structure of the fountain at Bellagio and it is also fun to overhear the public. That’s very cool that you’re intimately knowledgeable with the structure and materials of The Cloud. Thanks, Larry for dropping by my blog.